NZ Trade Minister Tim Groser with Ambassador Hamish MacMaster. New Zealand Trade Minister Tim Groser expressed optimism regarding the signing of a comprehensive free trade agreement (FTA) that will lower trade barriers between Saudi Arabia and other GCC countries. “We’re making a lot of progress as far as the New Zealand-GCC free trade agreement is concerned. There are just a few legal issues being clarified and ironed out,” Groser told Arab News before he left the Kingdom on Tuesday. 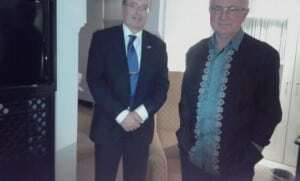 Ambassador Hamish MacMaster, who was with Deputy Chief of Mission Greg Lewis, accompanied Groser during the exclusive interview at a hotel in the Saudi capital. Groser added that the FTA is within the framework of a comprehensive strategy with which New Zealand will deal with the Kingdom and GCC countries over the next five years. He said that if and when the FTA officially takes effect, it will also promote trade, create job opportunities and high-paying jobs as well as improved incomes. “We’re just a small part of the equation but our experience with FTAs is that these could also serve as platforms to develop other forms of cooperation between or among countries,” Groser said. Groser was visiting the Saudi capital for the second time although he travels extensively in the Middle East. “However, we see some opportunities. New Zealand and the Gulf states are complementary on atomic renewable energy. We import fossil fuel from them and we export food to the GCC,” he said. He stated that being producer of agricultural products, New Zealand needs water, with which the GCC doesn’t have much, adding that 70 percent of the world’s fresh water is used in producing food. “In the long term, a system of free trade is also about natural use of resources. Our resources are around water and application of science to produce food while the GCC countries have to observe a rational limit to the use of water,” he said. Aside from the FTA, which New Zealand is finalizing with Saudi Arabia and other GCC countries, there are also 85 companies in the Kingdom in the agribusiness. “We also have a variety of specialists with different skills in Gulf countries as a whole,” he said, adding that there are also some 5,000 Saudis students in New Zealand, which would be a considerable addition to the Kingdom’s human resources if and when they return to Saudi Arabia. He added that New Zealand also gives training in aviation, noting that the UAE is establishing an aviation university in Dubai, which had chosen his country to provide traffic controllers who would become instructors. Groser added that his country also gives a free visa entry to all GCC nationals, which is advantageous to parents who want to visit their children in New Zealand. “Those that I have mentioned are just a few examples of things that we do quite well. We’re limited to a few specific areas because of our small size but I think the GCC countries appreciate us for our being independent-minded partners,” Groser said.